← QotW: Does the current state of a marque affect how you feel about its classics? Subaru has been putting a lot of old wagons in their recent commercials. And by a lot, we mean two, but it’s still more than what you’d expect to see. 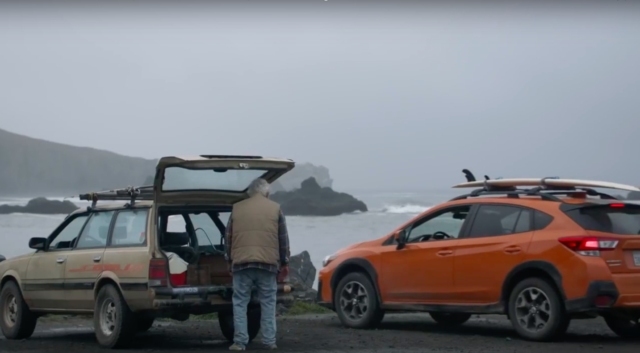 In the latest spot, called “Forever Young,” a grandpa and grandson meet on the beach in their respective Subaru wagons. The grandson pulls up in his fancy new orange Crosstrek, but gramps is still rockin’ a tan Loyale 4WD wagon from the early 90s. Not only is it still ticking, ot’s outfitted with a surf rack and beefy tires. Now that’s a cool granddad. tagged: cm, leone, Loyale, subaru, wagons. This ad has been on the air for a while. That’s a pretty cool idea with the modern-day equivalent car. Now if only Toyota would bring back mini-trucks, then they could do one. Are you sure? I believe that generation of Crosstrek debuted in 2017. I love that EA82, I just wish mine wasn’t such an electrical nightmare.